In Christian belief, the star of Bethlehem, also known as the Christmas star and the first star, appeared in the sky to reveal the birth of Jesus Christ to the three wise men. The star was recorded as a miraculous sign and is a momentous element of Christmas belief and tradition. 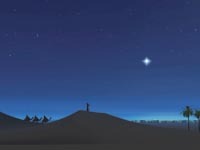 As such, the star has taken an important place in many cultures’ celebrations of Christmas, including Eastern Orthodox followers’ tradition of strict fasting, with nothing eaten until the first star appears in the evening sky. “I remember gathering at the living room window with all of my cousins, dressed in our little Christmas dresses and frilly white socks or little suits, each of us watching the sky closely, trying to be the first to spot the first star in the night sky,” says mother of two Larissa Kostyra-Costa. “We were excited and anxious, and when one of us finally saw the star, we raced to the table for the Christmas feast.” Many families of Polish, Russian and Ukrainian decent, among others, hold this tradition, honoring the deep symbolism of the star’s first appearance. Astronomers have differing theories about the star of Bethlehem, with some saying the Christmas star may have been a supernova, a comet or the aligning of two planets. Debate continues, and some astronomers believe the star was Sirius, the brightest star in the night sky. This focus on the night sky has launched holiday season planetarium shows, and documentaries about the star of Bethlehem air on television during Christmastime. The spotting of the first star in the sky on Christmas Eve has become such a magical tradition that non-Orthodox families have embraced it as part of their own family traditions. Children and adults peer out windows or step outside to see whether they can spot that first star, and enthusiasm builds for the family feast. Family cooks and hosts admit that “go look for the first star” conveniently occupies the children so the meal can be prepared, but families do remind the children of the Christmas star story. Many families also make the search for the first star more fun and educational by incorporating a high-tech element. A large number of star finder apps for the iPhone, iPad and Android exist on the market, so those festively dressed children look on in wonder as an adult holds his or her device up to the night sky to reveal the stars, planets and constellations above, even if they’re hidden by cloud cover and not yet visible. These apps come in varying modes of complexity, with some showing basic outlines of constellations and some illustrating, say, a bull for the Taurus constellation or an imposing figure of Orion rather than a collection of dots and lines. Some star finder apps provide real-time satellite photos of actual planets in the distance, stars and constellations and add an educational element by sharing the legend about each constellation and facts about each planet. Children learn and are captivated, and adults new to this technology find themselves awestruck, as well. Some star finder apps provide real-time satellite photos of actual planets in the distance. Starmap, $11.99, for the iPhone and iPod Touch, reveals more than 2.5 million stars, constellation outlines, meteors and distant planets, plus legends and other codes for more information. Star Walk, $2.99, for iPad, is the Parents’ Choice Gold Award winner and a nominee for the 2012 Webby Awards, which are for the best apps on the market. It’s noted for its realistic images of planets and stars, with daily updated photos and upgraded music that can play while you’re stargazing. Star Chart, $2.99, for iPhone or iPad, provides visual depictions of the planets and is noted as a leader for overcast nights. This app allows the viewer to explore the surface of Mars and follow NASA’s Curiosity rover in real time, as well as providing in-depth information on stars’ and planets’ distances, histories and legends. GoSkyWatch, $9.99, for iPhone and iPad, is noted for its fast and clear depictions of heavenly bodies, and links connect the viewer to Wikipedia for details on items in view. Star Search, 99 cents, provides very basic views and information and may be good for beginners. GoSatWatch, $9.99, provides planetary information but focuses on satellite locations and movements in the sky. It will identify satellites passing by overhead, which may captivate youngsters who see “something moving out there” and wonder whether it could be Santa’s sleigh. Search your phone’s apps store to assess the star finder apps applicable to your phone, recent releases and upgrades and award-winning programs with special features. Families may gather outside on the front lawn or on the back terrace of the Christmas host’s home, sharing their tech gadgets, pondering the heavens and marveling at the fact that the sky they are looking at now was the very same sky above the three wise men’s heads, and perhaps the stars they see are the very ones so important to the story of Jesus’ birth in Bethlehem.